HÀ NỘI — Despite worries that education will be commercilised as schools are sold and bought like commercial products, schools invested by private enterprises are operating well. Since 2013, 15 private universities, mostly in the south, have been bought by economic corporations. The latest are the Gia Định and Hoa Sen universities which have been taken over by the Nguyễn Hoàng Group. Earlier in 2015 and 2016, the group became the only shareholder of Hồng Bàng International University and Bà Rịa-Vũng Tàu University. Nguyễn Hoàng Group is now the shareholder of the most private universities in Việt Nam. Institution of American Education this year bought Phú Xuân University in central Huế City. A principal of a HCM City-based university told Tuổi Trẻ (Youth) newspaper the majority of HCM City’s private universities are now managed by major groups. A lot of economic corporations most of which are owning private higher education institutions in HCM City have been working with universities in southern provinces of Đồng Nai and Bình Dương to negotiate the transfers. According to educational specialists, the Government has tightened the criteria in terms of capital, land fund and staff for the new establishment of private higher educational institutions. It also orders not to newly set up private universities in Hà Nội and HCM City. The minimum investment required by the Government to start up a university is VNĐ1 trillion (US$43 million), not including the cost of land lot where the school will be built. According to Dr Nguyễn Đức Nghĩa, former deputy principal of HCM City’s National University, the transfer trend has emerged as establishing new universities requires complicated procedures and large investment. Meanwhile, they might spend less on buying universities. It is estimated that transfers over the past five years are worth between VNĐ100 billion ($4.3 million) to VNĐ500 billion ($21.5 million), lower than at least VNĐ1 trillion they are required to have if they want to establish a new institution. Professor Trần Hồng Quân, former minister of education and training, president of Association of Việt Nam Universities and Colleges, told Tuổi Trẻ the problem does not lie in who owns the university - the individual or the group. “The utmost concern is education quality,” he said. Sharing the same opinion, educational expert Phạm Thị Ly said private universities are like enterprises. The weakly-operated ones will be merged and managed by strong groups. It is better than leaving those universities operate independently but can not recruit students, she said. Nguyễn Hoàng Group claimed education quality orientation will be determined by lecturers and school management board. The investor (the group) will not involve and make impacts to affect the school’s development plan. Dr Nghĩa said although there is no official assessment, it is observed that private universities under the management of economic corporations are operated better and attract more students. This is positive for the development of private universities, he said. 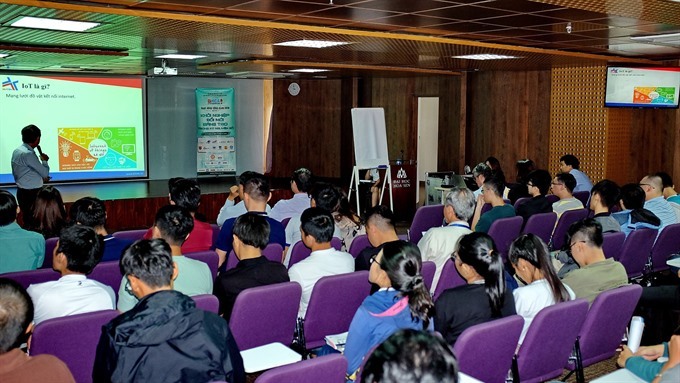 In fact, after the transfer, universities such as Văn Hiến University, Economic and Finance University in HCM City, Hồng Bàng University have their facilities upgraded and newly built. Some universities escaped out of debt and shortage of students. According to Dr Nghĩa, the draft law on higher education scheduled to be approved by the National Assembly this month is expected to give more preferential policies to groups which are willing to invest in private universities. “This is such a golden chance for economic groups to step into Vietnamese higher education,” he said. “Investment in private educational systems in Việt Nam in the future will be the playground for major groups,” he said.